Synthetic Cartilage Implants are somewhat new to the U.S. but was introduced in Europe about a decade ago with much research already done on the material used to create these synthetic cartilage implants. Today, The Foot Doctors at Foot Healthcare are experts that can provide patients relief from arthritis in their toes. What are the uses of Synthetic Cartilage Implants? Toe Arthritis is caused by inflammation of the toe joint and is most common in the big toe of the foot (hallux rigidus). Previous trauma to the bones (breaks or Sprains) can cause Arthritis to develop in the big toe. Genes can also contribute to Arthritis. Osteoarthritis happens when the cartilage between the joints break down either due to disease, genes, or age. The wearing down of cartilage causes the bones to rub together which will contribute to even further damage and pain. The human body is limited in its ability to repair cartilage, as a result it also becomes worse with age. How can Synthetic Cartilage Help Me? The most popular current surgical treatments help relieve the pain by fusing the bones together or by using metal implants. As a result fusion surgery limits motion and flexibility. This can severely hinder any type of activity involving walking or other activity where the foot requires any foot flexion. In Addition to limiting flexibility, material wears down after years of use in joint fusion. 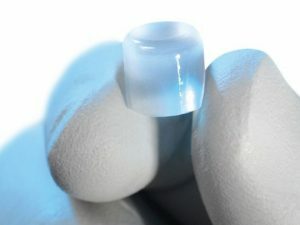 Another option, The new Synthetic cartilage, actively replaces the ‘worn out’ cartilage to provide the patient with benefits just like their own cartilage. 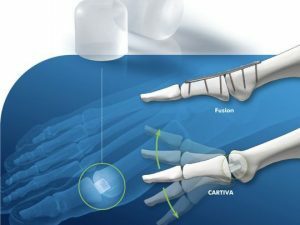 Hence, the synthetic implant in the great toe provides patients about 50% of their pre-arthritis flexibility! The surgeons at Foot Healthcare Associates are the best doctors for synthetic cartilage implants. Call us today to see if you qualify for this exciting treatment option! 1- Reindl, JC. 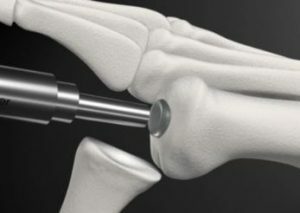 “http://www.freep.com/story/news/health/2017/03/20/synthetic-cartilage-arthritis-toe/99256322/” Detroit Free Press Web. 21 Mar 2017.